When planning your wedding, all you may be thinking about is how you want it to be a unique and memorable event. You might be designing the decorations for the ceremony and reception yourself, or you may be working with a professional who can turn your ideas into realities. Whatever the case may be, you want to make a statement, and that statement can come from everything from the centerpieces to the lighting. At Lumen Lighting, we can provide wedding lights that will look amazing, no matter the setting! 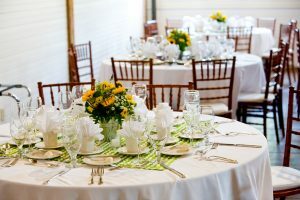 Decorating your wedding reception can take a lot of time and effort, and as you and your betrothed consider all of the options, it can be difficult to know where to start. Do you start with the flowers and centerpieces, or do you choose the tablecloths and drapery first? Hopefully you already know what your wedding colors will be, but if not, that will be the best place to start. The sheer fabric that we use for our drapery decor can work well with any colors, and we’ll match the look and feel of what you have in mind in terms of volume and placement. The last thing we want is for your reception venue to feel overwhelmed by decoration! Many couples opt for simple, yet elegant weddings where the perfectly placed light or decoration makes all the difference. You don’t need a ton of illumination, and our strand lighting can make an understated impact in any setting. If you want illuminated foliage for a corner or the entrance to your reception, we’ll place them in the perfect spot so that the ambiance is exactly what you want. The focus of the reception is of course you and your new spouse, but the focal point can be anything you want, such as a chandelier above the dance floor. A chandelier, while perhaps not quite the “less is more” approach, can create a strong focal point that ties all of the decorations together. We have a number of options to choose from, and we’ll gladly help you with your decision based on budget, setting, and other factors. While October is now here, the number of outdoor weddings in Utah will most likely begin to decrease, but if you’re planning a spring or summer wedding for next year, now is the time to begin thinking about lighting and decor. You might be having your reception in a park pavilion, or you may be renting a large tent under which all of your guests can sit, dine, and dance. No matter what the outdoor setting is, we can recommend and install the appropriate lighting for the space. We’ll listen to what type of statement you’d like to make and then provide the best options based on your desires. When you’re searching for professional wedding lighting in northern Utah, contact Lumen today. We’d love to meet with you and discuss your needs, and help you find the best options for your big day.